Ademo has fought for justice for many people over the years. I wish him well in his effort on this day. 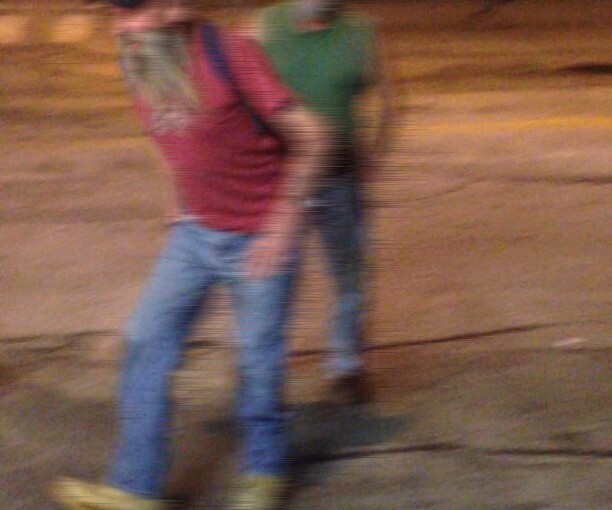 So I’m free for now….. looks like I’ll be representing myself at trial next week. I refused the states offer to drop one Felony 3 and plea guilty to the other. Then sentencing me to 36 months in prison, suspending that for 6 months in county and three years (or more) of probation. I am going to go live tonight here on Facebook to share my thoughts and backstory. 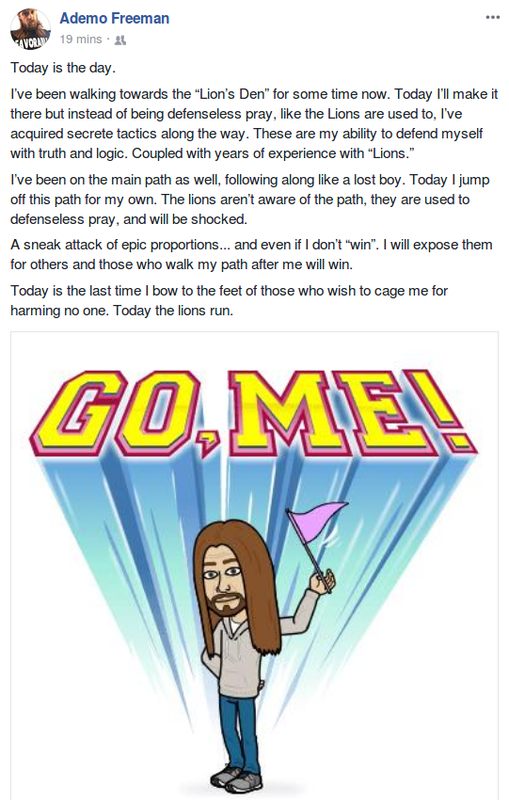 My only hope is that a compassionate jury or juror sets me free. 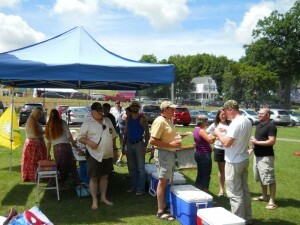 This will be our second annual fellowship cookout in the heart of New Hampshire’s most beautiful region. 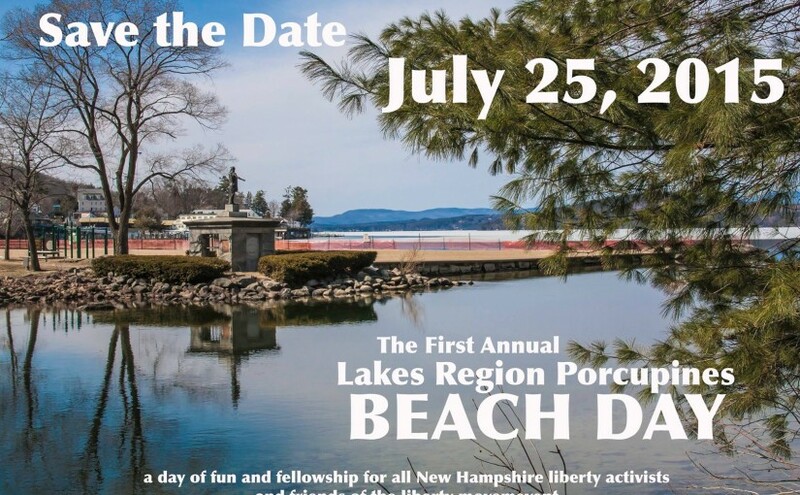 Join the Lakes Region Porcupines and enjoy a day of fun at Ahern State Park in Laconia. There are plenty of hiking trails, two sandy beaches and plenty of space for your little ones and your doggies. There are no fees for the park or parking. This event is our annual charity fund-raiser for the Center Harbor Food Pantry. For a $20 donation, you are giving the food pantry a way of feeding needy families from all over the lakes region. With that donation you’ll get yourself a fat burger, hotdog, chips and a drink. You’ll also get to taste Representative Glen Aldrich’s World Famous Potato Salad, which is worth the price of admission in itself. If you have kids no worries, they’re eating for free. We welcome dietary changes, and can work to accommodate you, just contact us. If you prefer to bring your own food, we simply ask that you provide the suggested donation of $10 so we can help out the Center Harbor Food Pantry. We know the PorcFest hangover takes about a month. 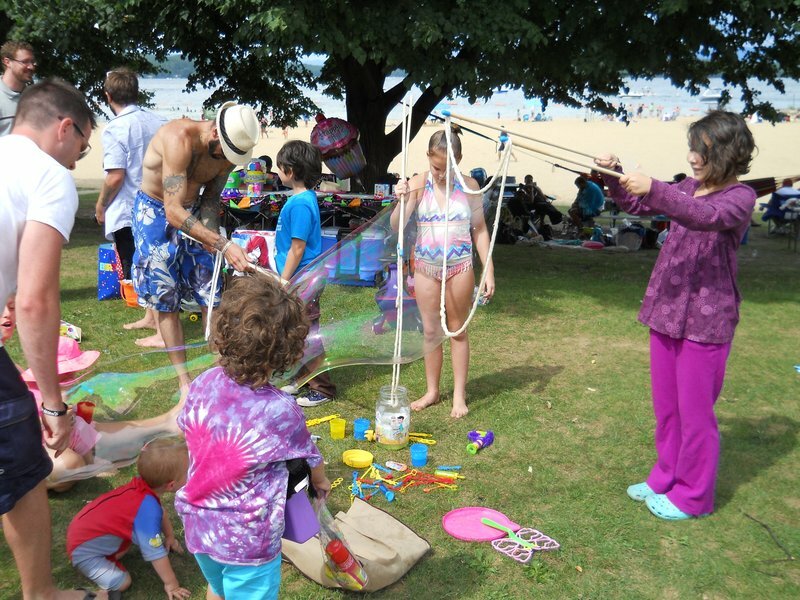 LRP Beach Day is just in time to reunite with those awesome people you met in June and have a day of swimming and hiking with new friends as well. If you purchase at the door, we bump it up to $25. Save yourself $5 and commit now to a great day of liberty fellowship! 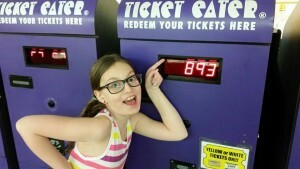 Have you ever thought about what it would be like to invite the entire NH liberty movement to Funspot – the largest arcade in the world – and play video games, indoor mini golf, bowl, darts, pool, bingo, drink, eat and have fun for hours? It was a blast! 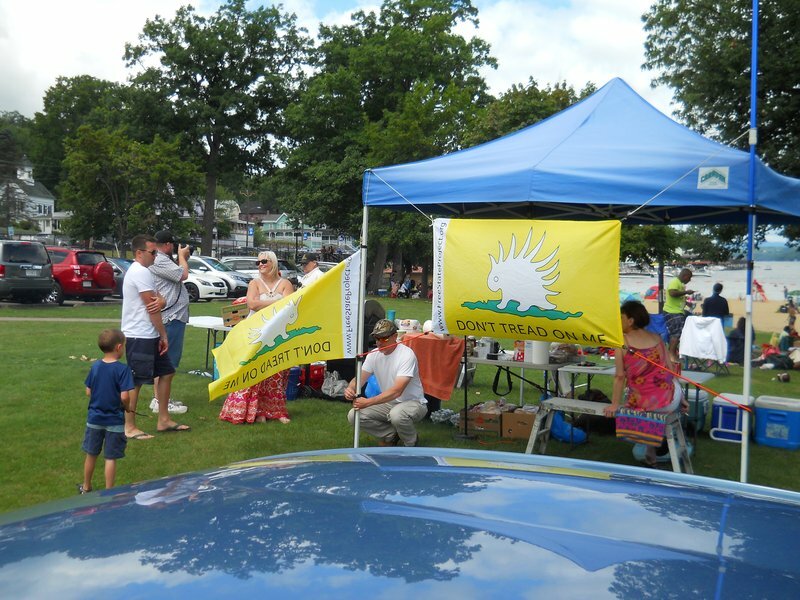 LibertySpot 2015 was a great success, and we’re doing it again. Mark your calendar April 16, 2016! We’ll start with our regular Lakes Region Porcupines meeting at the New Hong Kong Buffet at noon and then move on to Funspot from 2:00 until 11:45! It turns out, the founder/owner of Funspot, 85-year old Bob Lawton, is a big fan of liberty and his favorite book is Ayn Rand’s Atlas Shrugged! 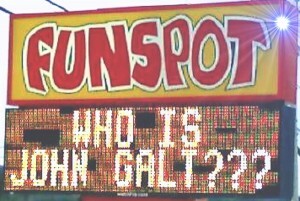 When Funspot turned on their new digital sign in the 1980’s, the first message Bob put on it was “Who is John Galt?” Did you know Bob was the State Rep who sponsored the bill to put “Live Free or Die” on our license plates? To make this day even more epic, everybody’s encouraged to wear their favorite liberty gear! Wear an FSP tshirt, an NHLA polo, a Mises bracelet, a Ron Paul hat, a gun rights tshirt, whatever you want! You’ll be surrounded by fans of liberty! Bingo starts at 6:45pm in the building next door to Funspot. The D.A. Long Tavern, the bar inside Funspot, opens at 1pm on Saturday (only ages 21 and up can enter the Tavern and drinks must stay in the Tavern). With a big space and lots going on, let’s gather out at the marquee for a group photo hourly from 3:00 to 6:00. Which do you prefer, ‘Who is John Galt?’, or ‘A government big enough to give you everything you want…’? 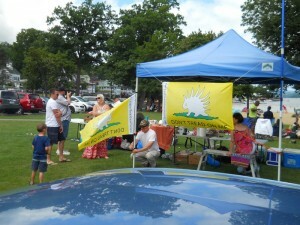 Come out and have fun with other NH liberty activists! Join and share our event! See ya there! Thank you Vince Perfetto (101 Reasons Film) for creating a great day and getting the ball rolling in 2015! As we get into the middle of our summer season, we have lots coming up in the next couple of weeks. Saturday July 18 at noon is our regular monthly meeting at the New Hong Kong Buffet. 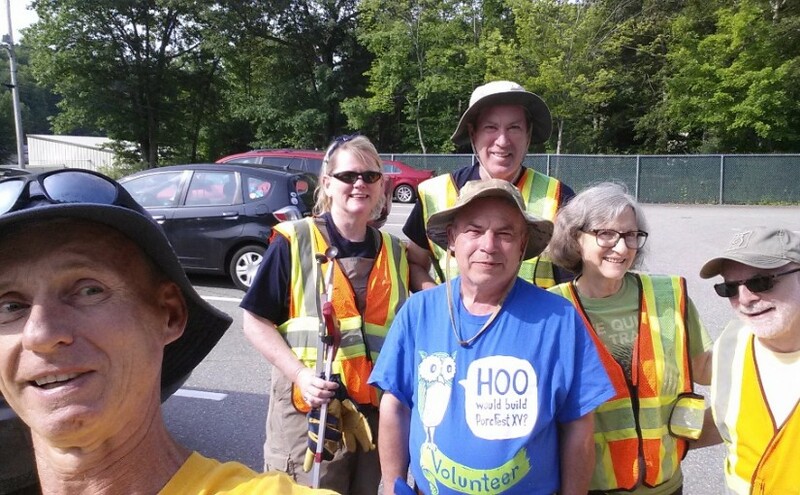 Sunday July 19 at 8:00 a.m. we’ll gather at Shooter’s Tavern for a hearty breakfast prior to launching our litter pickup on RT 3. 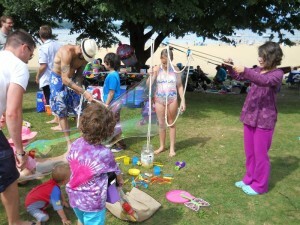 Friday July 24, early arrivals for Beach Day can catch the fireworks show at Weirs Beach. 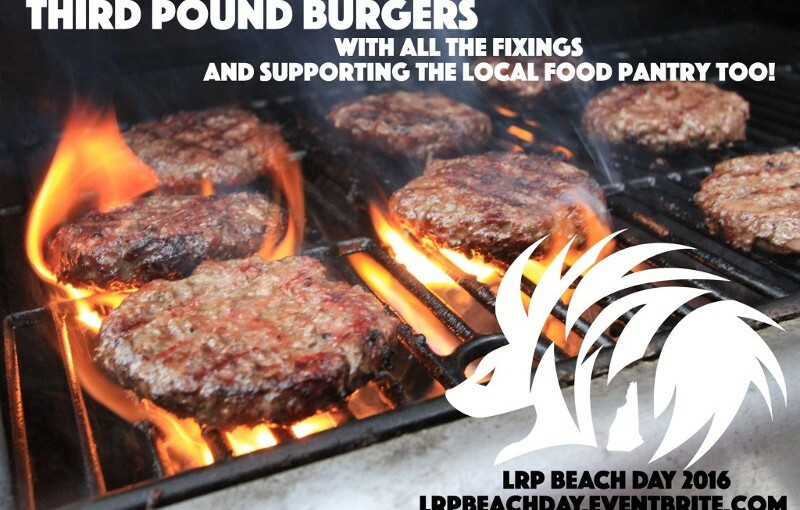 LRP Beach Day Sunrise Photo Shoot 5:15 a.m.
LRP Beach Day Skee Ball Tournament at Funspot 5:00 p.m.
Much info available on Facebook or comment here to get questions answered. You know there is liberty to be found here. 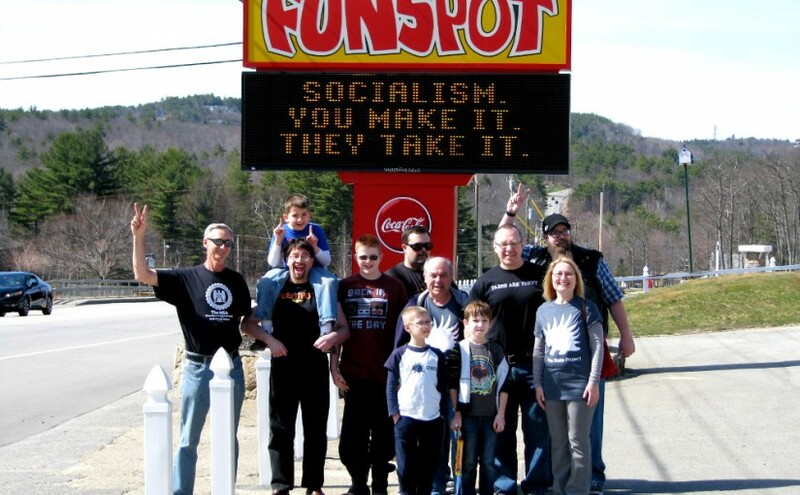 Have you ever thought about what it’d be like to invite the entire NH liberty movement to Funspot – the largest arcade in the world – and play video games, indoor mini golf, bowl, darts, pool, bingo, drink, eat and have fun for hours? Let’s do this! Mark your calendar April 18, 2015! 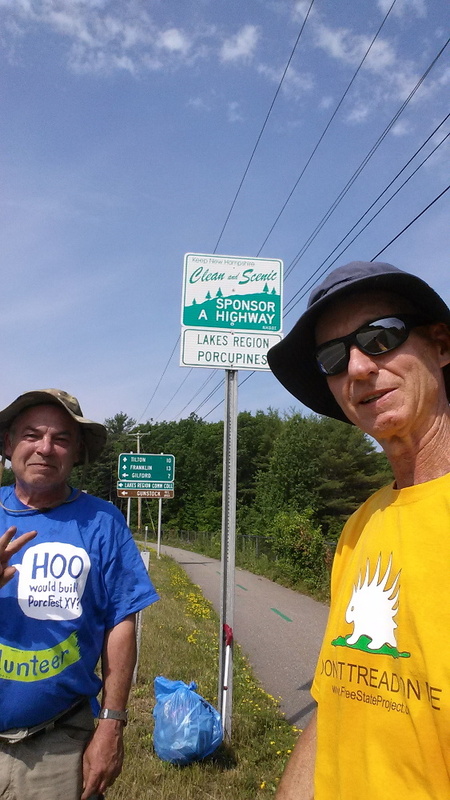 We’ll start with our regular Lakes Region Porcupines meeting at the New Hong Kong Buffet at noon and then move on to Funspot from 2:00 until 11:45! It turns out, the founder/owner of Funspot, 84-year old Bob Lawton, is a big fan of liberty and his favorite book is Ayn Rand’s Atlas Shrugged! 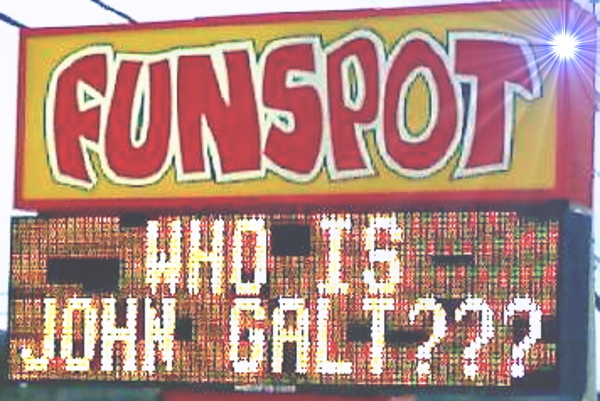 When Funspot turned on their new digital sign in the 1980’s, the first message Bob put on it was “Who is John Galt?” Did you know Bob was the State Rep who sponsored the bill to put “Live Free or Die” on our license plates? Thank you Vince Perfetto (101 Reasons Film) for creating a great day of fun! Planning for our Beach Day this summer. We’ll soon be ready for our spring cleaning on our adopted highway. 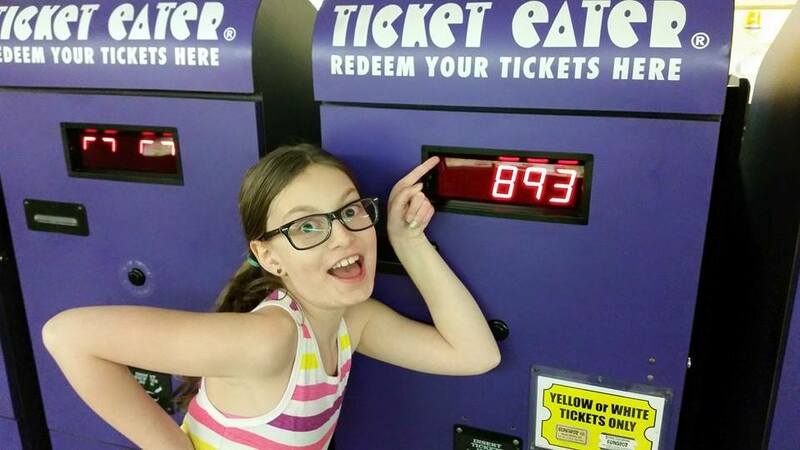 There is another plan for a big day at Funspot. Welcome home plan for Firecracker Joe. Our meetings are rather informal gatherings which run for an hour or two. We’re looking forward to seeing you.